I can't help myself. It's winter here. I have to do a knitting post. I'm starting to see myself as a dishcloth queen. When I travel around, I ask people if they knit and if they do, if they knit dishcloths. It surprises me that not everyone does this kind of knitting. One of the many aspects of simple life is to home produce what you can in the time you have available. We had some beginners knitting and crochet sessions at the Blackheath workshops and I hope that will start those ladies off on a lifelong supply of dishcloths. This knitting is portable, easy and empowering. Since I started knitting dishcloths, I haven't bought Chux or any other dishcloths from the supermarket. They are expensive here costing about $4.50 for a pack of 10 or $6.50 for a pack of 20. If you're buying them and not washing them and reusing, they're costing you somewhere between 35 to 45 cents each. Why would you want to spend that kind of money on something you're going to throw away? Over the years I've saved a lot of money not buying into this commercialisation of dishcloths. I use pure cotton dishcloths for washing up and facecloths, and rags for the dirty cleanup jobs when you usually need to throw the cloth away. The rags are simply old bed sheets and towels that are on their last legs but are cut into eight inch squares cleaning rags to extend their life. I use knitting cotton to make my cloths. I usually use plain cotton but sometimes I'll use organic cotton if I'm making some as a gift or facecloths for a baby. Any sort of 100 percent cotton is suitable and you can use whatever size needless you have on hand. I usually use needles anywhere between a 4 and a 6mm. Cotton is the best option because it dries fairly fast, it can be easily washed with the weekly wash and when dried in the sun, the sun will disinfect your clean cloth beautifully. I have about 20 cloths in my kitchen basket so I have plenty to use and replace every day or two. When the cloth is dirty, I hang it over the side of the wash basket so it's not in with the dry dirty clothes. It's just washed with the regular washing and hung out to dry. Used in this way, a cotton cloth will last about five years and in that time it's saved you a lot of money. If you're not knitting or crocheting your cloths I hope this post encourages you to do so. Start with a slip knot. 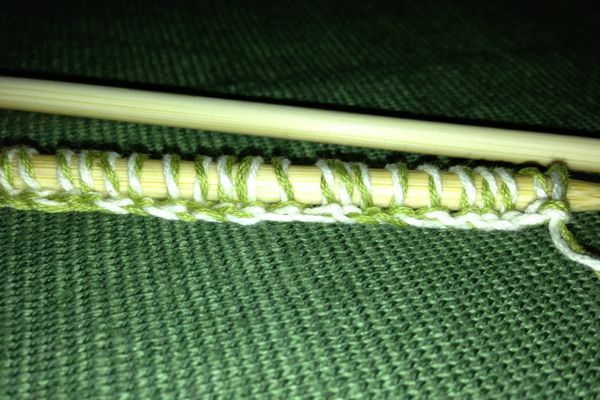 I'm using a nice Japanese organic 4ply cotton here with 5.5mm bamboo needles. I'm using two strands of cotton on this cloth. If you want a loose weave cloth, just use one 4 ply strand. The finished cast on row. When you cast on and off, make sure you knit loosely. 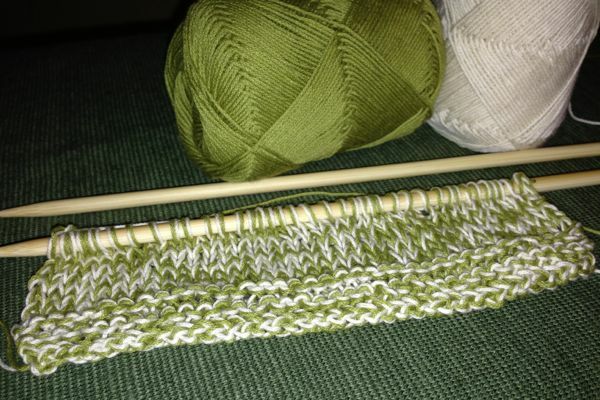 If you knit too tight, it will pull in those end rows and your knitting won't be square. If you're a beginner, don't try this until you're a bit more proficient. 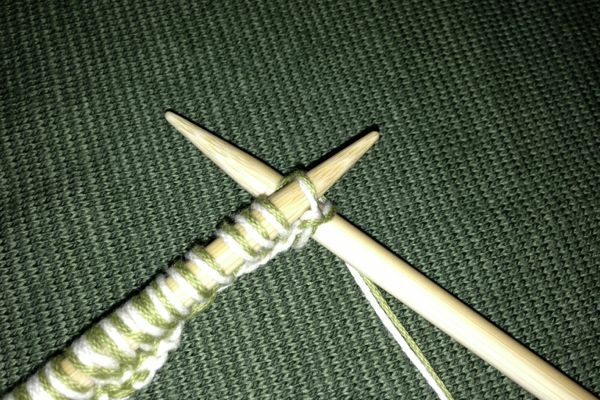 For someone who has knitted cloths before, use this stitch as your first row after the cast on. It will give you a smooth and firm bottom edge, not the loopy edge you often get with a plain cast on. It's easy - the stitch is the same as a knit/plain stitch but you start it off by putting your right needle into the back of the stitch. The half completed second row of knitting into the back of the stitch. You can see the neat edge it gives on the right needle. And here is the first two inches of the new dishcloth and below, a few more inches. This one will take me one or two days to complete, just knitting when I have a spare hour. All these cloths are simply cast on, a mix of plain and purl, then cast off. Your cloth can be any design. Let's face it, your dishes don't care if you are a neat knitter or you knit in plain or purl. All they need is for the stitches to be strung together so that makes these dishcloths the best sort of beginners' knitting. Even if your first cloth looks like a dog's breakfast, it will still be able to be used. Your next one will be better. If you're a knitter but have never knitted a dishcloth before, start by casting on about 30 - 40 stitches in either 4 or 8 ply cotton. Or you can do what I've done in the photos above and use two strands of 4 ply. Knit into the back of the stitch for the second row. That will stop that loopy untidy border that usually happens to a plain cast on row. Do about 5 rows of plain stitch to make the bottom border, then go on to 5 plain at the beginning and end of the row with whatever stitch to make up the middle of the row. In this example I've used stocking stitch. The 5 plain at the beginning and end will give you a nice border. End with five plain rows and cast off. Second, third, fourth and fifth row: knit/plain stitch for the entire row. Next row: 5 knit/plain stitches, then 20 purl stitches, then 5 knit/plain stitches. Next row: Knit/plain stitches for the entire row. Keep knitting those two rows until it's almost as long as you need it to be. Then finish off with knit/plain stitch for the entire row and repeat that row four more times. If you have any problems, go to the knitting forum here and I'm sure someone will help you. That will give you a good dishcloth. It's plain but you're a beginner and it doesn't matter if you make a mistake. Hopefully you'll knit a few of these and improve with each cloth. It's a great way to start knitting. If you're confident after a couple of cloths, look for some new patterns on the web and try something a bit more daring. I really hope you try this. It might feel strange at first to be holding those needles and cotton while trying to loop, slide and pull, but trust yourself and keep going. 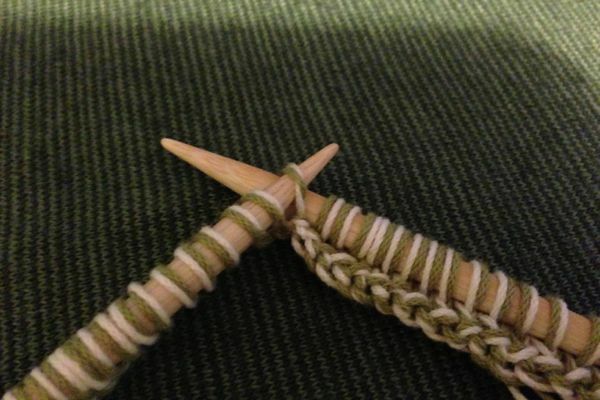 Learning how to hold the needles and cotton can be tricky but the more you practise, the better you'll get at it. And if you successfully teach yourself to knit, tick off another life skill you've mastered. If you're knitting dishcloths, or anything else, I'd love to see it. If you can, put a link with your comment so we can see what you're doing or post a photo on the forum. You never know, your knitting might be thing one thing that inspires someone to take up their needles and start. I really want to do this, but I don't know how to knit. I can only crochet. What kind of crochet stitch would you suggest for a good dishcloth? That's a lovely cloth. I really like that border. I don't knit, though I do crochet. However, I have to say that I haven't really liked any of my crocheted dishcloths. The texture just isn't right to me. But my grandma knitted me three dishcloths when I got married, and I LOVED those. (So much that I asked her to make more a few years ago, in fact!) 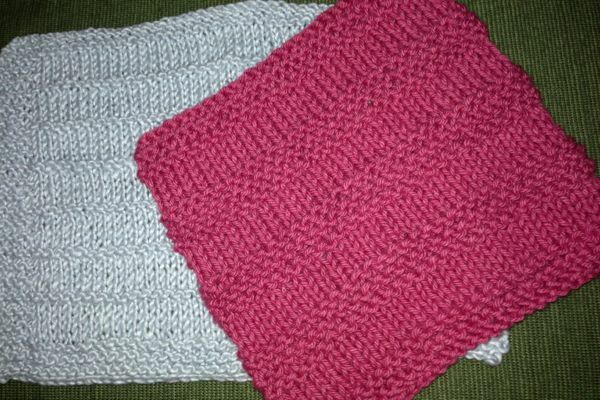 And someone gave me several knitted facecloths for my first baby - awesome gift! As far as the rags go, I cut up T-shirts that have become too holey to wear. These make great cleaning cloths (and since they're knit, the edges don't ravel! ), and I have so many that I don't feel bad if one is so nasty that I just throw it out. I keep a wire basket under the kitchen sink to collect the used cleaning rags, then take it to the laundry when full. I just wish I could convince my husband to use them instead of paper towels....but I've trained my children to reach for the rags first, and so we've drastically reduced our use of paper towels here. I knit my own potholders -- nothing fancy. Three strands of Sugar & Cream, size US 8 needle and about 32 or so stitches..knitting all rows. I've crocheted some dishcloths with a single strand of S&C, but you're using two strands and they look much thinner. Hmm...My dishcloths seem to take forever to dry. I'm heading to the knitting forum right now. Have been wondering how you use these cloths; to do the dishes or to wipe surfaces? I do my dishes with a brush made with horse hair that I've been using for years already. Wiping surfaces I do with old towels that I cut up in cloths. Hello Eveline. I use them to wash the dishes in the sink and to wipe the benches. I also have some for general cleaning in the house. Rhonda, I am interested to see that you use your knitted dishcloths to wipe over the benches. I knitted my first couple of dishcloths a couple of years ago after seeing them on your blog, however I have reverted to store bought ones really because I found the knitted ones retained too much moisture and my benches stayed too wet after wiping. Do you notice this? (Maybe I need to strengthen my hand muscles so as to wring out more water before wiping?!) Thanks for your blog, it's always a great read. Tully. Though not natural fibre I found some polyester microfibre wool and made dishcloths they're great for the kids as it soaks up everything and also polishes my stainless steel bench a treat. Prepare to be a bit grossed out but I am still using the microfibre cloths that I used to stuff the pocket cloth nappies with! The youngest has been out of nappies for over a year and those microfibre cloths are starting to look a bit "done" now so I may try knitting up some white cotton ones. I'm just about finished a king-size blanket (garter stitch, done on circular needles, super-chunky merino wool, stripes of various shades of grey and purple) so I feel like easing down to something small and portable! I have in the past knitted my own cloths but it is so hard to buy cotton here at the moment as all the wool shops in our area have closed down and I hate buying on line as I have had things go missing in the past in the post. Check out YouTube for lots of easy knitting tutorials and for dishcloths with borders. That's where I learned to knit dishcloths. I'm working on a hat now using a YouTube tutorial. Thanks Katherine. Let me know when you make one. I find the cloths take forever to dry. One Christmas I knitted some for gifts and they were not well received. At present I use old rags for many jobs. 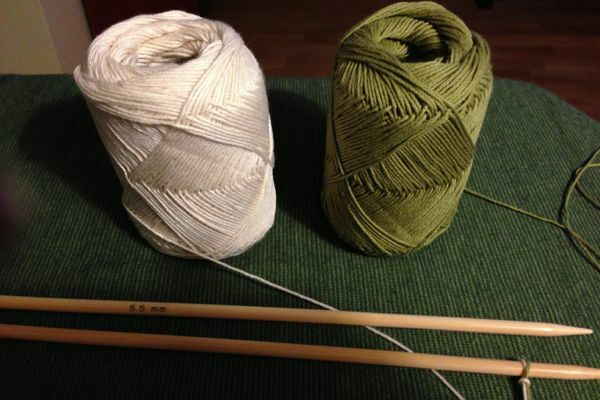 Suze, try knitting with a thinner ply, say a 5 or 4 ply. If you use larger needles with 8 ply you'll get a similar result. The thinner ply and larger needles with 8 ply will give you an open weave cloth that dries faster. How terribly rude that your well thought gifts were not well received. I bet they were lovely and I am sure someone will appreciate them next time around. Rhonda, thanks for your post on knitting dishcloths. It is timely with this dismal weather we are having. I have knitted several dishcloths but haven't used them as yet as it is so hard to get anything dry here at present. I hope you are having better weather at your place. We are going to Caloundra in a few weeks so are not sure what to expect weather wise. Perhaps I will take my knitting with me! yay! I knit dishcloths! My grandmother taught me to knit and that's really the only thing I knit - I did some hats and scarves and I have a pair of socks on the needles, but I'm not enjoying them so they're taking forever. HOWEVER, I LOVE to knit dishcloths. Thanks for this post Rhonda. You inspired me a while back to start doing dishcloths and face washers, and I became a bit addicted! ;) I am a very beginning knitter, so they are a bit wonky. This last week I have started on crocheting some more for something a bit different. Hi Rhonda i have just finished knitting two for my daughter i love the knitted dish cloths and no way would i go back to the bought ones,if you would like to see the ones that i have knitted go here. Rhonda thank you for sharing this pattern with us. I forgot to ask at the Blackheath workshop if you wash your dish cloths in cold water. I currently knit or crochet my dishcloths and use old teatowels I've cut up in place of paper towels than just wash them. At the moment I wash my cleaning cloths / dish cloths seprately and was wondering is it ok to throw them in with the normal load? Timely post, Our Rhonda, as it's World Wide Knit In Public Day which is actually a week long event...let's get out there and knit and chat!!! I must have sensed that in my bones, Sue. I use polar fleece as a dish cloth. (Left overs from sewing) the have the perfect amount of absorbency, and machine wash really well. But use your knitted idea to make facecloths for Jarvis. This reminds me that I should make some more dishcloths. I've crocheted mine in the past but might knit some for a change. Great idea for a baby cloth as a friend is due in several weeks and this would make a wonderful gift. Good post! I enjoyed our discussion about dishcloths at Blackheath. I need to learn how to repair holes in my well used dishcloths, four have gone to rack and ruin because I didn't repair them when holes first started. I can do simple hand stitches but I didn't know whether to "pull" knitting together to close the hole or what, so I ended up not doing anything. I have the same problem with holes in knitted garments. I enjoyed it too, Rose. I love discussing the simply philosophy behind the things we do. My mother would call it "the whys and wherefores". Anyhow, here is a very good tutorial on mending knits. I've been meaning to add it to Weekend Reading and keep forgetting it. Although i have always knitted it is because of you i actually started making dishcloths several years ago. I like the roughness of the knitting for them. My favourite one is starting with one stitch and increasing one either side, every 2nd. .row to big enough then decreasing back to one. I love my knitted dishcloths! A friend sent me one about 3 years ago and I used it constantly. Early this year I put in an order for her to make me 3 more of them. They do such a good job of getting every little bit of grime off the dishes, and there's no need to worry about them scratching Teflon coated pans. Hi Rhonda, we have been busy here knitting all week end, well my Mother in law has. She has made me a nice little stock pile of clothes, me I'm still struggling with my first sigh. Never mind I'll get there. I am knitting baby washcloths for a gift at the moment, using the Bendigo 4 ply cotton and 4 mm needles, and your waffle weave pattern. The cotton comes in 200 g balls, which will make a lot of dishcloths ... And very nice to knit with. There are some variations that try to make the corners more uniform, but these work fine. I usually make the border a stitch wider though, which requires some fiddling with the beginning and ending. Searching 'knitted washcloth' or 'knitted dishcloth' on the web will yield more than you want to deal with, but the fancier ones (and even the plain ones) also make great hostess gifts. Just stack a couple together and tie them with a ribbon or a 'ribbon' made of multiple lengths of contrasting yarn. I use worsted-weight cotton for them, usually white, which can be bought cheaper on 1 pound cones, and can be bleached if necessary. I use some in my kitchen as padding between things in the cupboard that I don't want scratched, and two of the newer, thicker ones stacked together make a fair pad for a hot dish as well. Rhonda, didn't you write at one time about using a strand of crochet cotton along with worsted weight softer cotton, to improve the scrubbing ability? And Rhonda, I forgot to ask - I have no idea what Chux thing you're talking about. Who would buy dishcloths to throw away? They add no work or water use to doing laundry. My mother used bought terry cloth dishcloths which of course were washed for re-use, but I like my knitted ones better. Now I've got back into the habit of crocheting again this is something I really do intend to have a go at...just relies on me finding some sensibly priced yarn of the right type - preferably in the charity shop! I learnt to knit when I was about 7 in 3rd class at school, and the first thing we knitted was a dishcloth. I knitted my first jumper for myself when I was 9-10. since than I have done a lot of knitting until a car accident on the wasy to hospital to have my lst child, not hurt as such but a lot of muscle, tendon & nerve damage, so didn't knit until about 12 years ago when I knitted a christening dress for my first grandchild, so the knitting bug started again. My children and grandchildren all get knitted washers. This year the grandchildren are all (23) getting a towel that I have decorated and had embroidered with their name and a handknitted washer. We use them all the time in the kitchen, have done for years, Chookasdad made me a stand with with 4 "sticks" to hang my cloths on to air and dry, maybe this idea will help those that feel that their cloths do not dry well. I also use them for gifts and prb knit about 100 plus per year. Timely post Rhonda as I'm up to dishcloth no.5 in a pack of 7, which I'm making for my bestie back in the UK who has just moved into a new home. Each cloth is a different colour with a different pattern & some are larger than others, but all made from pure cotton or a bamboo/cotton mix. I have no idea how she will react to a housewarming gift of knitted dishcloths, but I just love them & would be over the moon if someone made them for me. Been using knitted cloths for years now & they just last & last. Long live the knitted dishcloth!!! I recently rediscover to knit dishcloth and all the new design. My favorite is the waffle. Because I do weaving I use my 2/8 cotton that I use for my dishtowel, take 4 of them with 5mm needles. I live a simple life for more than thirty years and I happy to see that I'am not juste a special person in a comsumer world. While I admire people who knit I'm not one of them - too little patience I guess! I prefer sewing, so for dishcloths I cut up old flannel bed sheets. Two squares sewn together and turned inside out, that's all it takes to get some great dishcloths. They are vastly superior to that store-bought rubbish and I always have to smile when I use them! 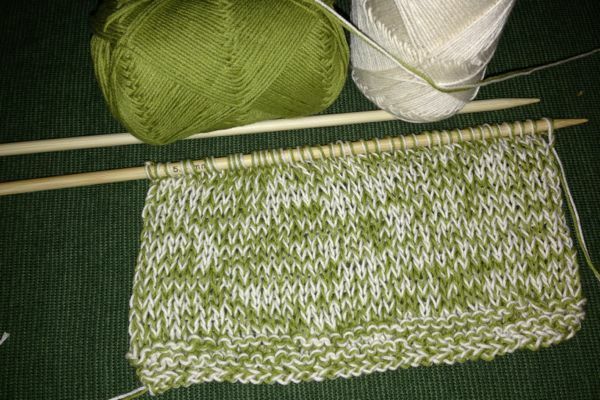 Just recently I knitted a dishcloth - and love it! it cleans so beautifully and doesn't take long to dry! I have since knitted a back-up and keep it in the linen press. I've also knitted a bench cloth and am considering where else I could use one. I hardly leave remarks, however I browsed a bunch of remarks on this page "Save money with knitted dishcloths". I'd like to keep up with everything fresh you have to post. Would you list of every one of your shared pages like your linkedin profile, Facebook page or twitter feed? Rhonda I just tried your trick of knitting into the back of the stitch for the first row after cast on. It works beautifully - the edge is lovely and neat rather than loopy and loose. Thank you!!! Went in last week to look for knitting cotton and they did not have any. I liked your Japanese organic knitting cotton, is it freely available and if so any ideas on where I can get some?. I have made 2-3 dishcloths a few years ago with the cotton from Spotlight but am unable to now get it. Hi Wendy, I use EcoYarns in NSW. Vivian gives excellent service and has a good range of yarns. http://ecoyarns.com.au/index.php She also stocks the Japanese organic cotton and she'll post all over Australia. Happy knitting. Awesome! I might use these as dishcloths, but also as something to practice purling etc on as I've only been knitting maybe 6 weeks...do you think I could get away with using (gasp!) 12 ply wool? Don't use wool. It will take ages to dry and if you use hot water, it will seize up and shrink. 12 ply would make it even worse. PS. I've found three patterns I can make without purling - for some reason plain knitting is ok, but I find purling hard on my fingers! Rhonda, Ive been knitting dishcloths since I read about it on your blog! I'm loving it and also finding friends who are looking forward to a couple for their birthday presents. I have been buying up cotton in charity shops when I see it, and came across this older post of yours when googling whether I could knit a dishcloth in 4ply.